So, what’s it looking like?” I anticipate this question, even before it is asked. I know I am expected to carry in my pocket a forecast of the 2019 elections. I deflect the question with a one-liner: “Pahle bhavishya batata tha, ab bhavishya banata hoon (I’m now into making futures, not telling it)”. It doesn’t work. Then I offer cold reason: “Look, I don’t have access to survey data of my choice any more”. They agree, but persist. I try to disarm: “The tragedy of being a politician is that people tell me only what they think I wish to hear, so I know much less than you do.” The incredulous look tells me they don’t believe me one bit. Here it goes, then: All you wanted to know about the 2019 elections outcome, but didn’t know who else to ask. Remember, it comes with a statutory warning: The author is a political activist who does not pretend to be neutral but strives to be truthful. Truth is that you don’t have to be a psephologist (whatever that means) to understand the basic outlines of the battle of 2019. All the theoretical apparatus you need is political common sense. It would be useful to refer to an archive of past election results, especially the outcome of the Lok Sabha elections, 2014. Voter for ABP. I have many issues with both these latest surveys, but even a straw poll is better than drawing room gossip. Let us think of India as five regions, each representing a distinct kind of battleground. And for the time being, let us focus on the fortunes of the BJP. Luckily, you don’t have to keep tabs on all the five regions for this election. 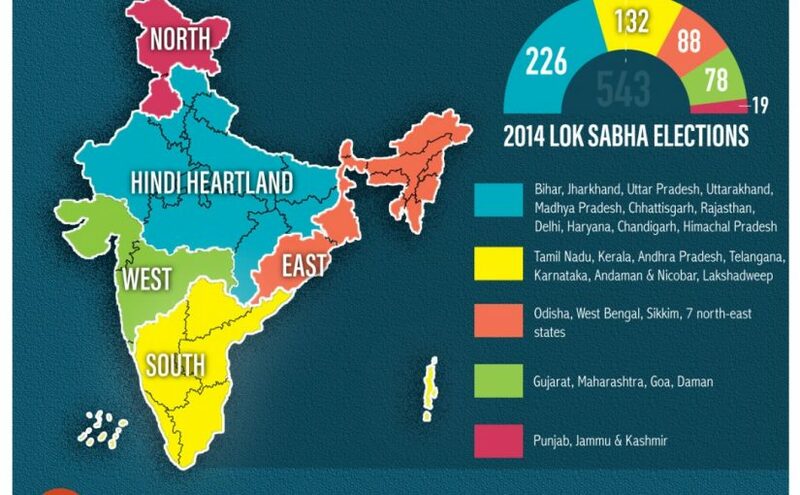 The battle of ballots in 2019 will be decided in one of these battlegrounds, the ‘Hindi heartland’ (heartland of Hindi speakers, not India’s heartland!). The logic is simple. Compared to its performance in the 2014 elections, the BJP is poised to make some gains in the East. These gains would be more than offset by its small losses in the West, the South and the tiny Northern region. The entire balance would thus depend upon the Hindi heartland region. If you know what would happen to the BJP in the Hindi belt, you know the outcome of the 2019 elections. Let us now look at each of these battlegrounds closely and understand why the BJP is jittery, notwithstanding its public grandstanding. The East offers the BJP its only growth possibility over 2014. It won 11 seats in this entire region and thus has room to grow. All credible polls indicate that its support base is growing in Odisha at the expense of the Congress and in Bengal at the expense of the Left Front. The BJP has followed the old Congress strategy of acquisition and merger to register unprecedented growth in the northeast. The BJP will be a force to reckon with in east India. The only question is whether it can convert its additional votes into additional seats this election. As of now, the BJP appears to have crossed that threshold in Odisha, but not in Bengal. It may overtake the Left to emerge as the runner-up in Bengal, but it is still way short of challenging Mamata Banerjee’s hegemony. It cannot grow more in Assam, but is likely to pick additional seats in the hill states of the northeast. All in all, the BJP may pick up to 20 additional seats from this region. The West is likely to witness a business-as-usual election with a small dent in the BJP tally. It swept this region in 2014 by winning all but six seats. Since then, anti-incumbency has hit it in all the three states. Rural unrest in Gujarat, farmers’ agitation in Maharashtra, its troubles with the Shiv Sena and the unholy and proxy government in Goa appear to have set the stage against the BJP in the region. Yet, the surveys suggest that the BJP can contain its losses. A Gujarati PM can help the party reverse some of its assembly poll setbacks in Gujarat. In Maharashtra, if the Shiv Sena goes back to the BJP, the NDA can take on the combined strength of the NCP-Congress alliance. In sum: The BJP may keep its losses to about 15-20 seats in this region. The South is likely to witness a series of critical elections that can shape the future of state politics. But precisely for this reason, the Lok Sabha election is likely to be focused on regional issues and personalities. Modi vs Rahul presidential-style contest makes no sense here. The BJP has low stakes in the region, as it won only 22 seats here in the last election, of which 17 came from Karnataka. All indicators suggest that the BJP will remain a marginal player in this region. The BJP’s attempt to acquire the AIADMK seems to have failed. The DMK appears to have taken an early lead in this critical first election after the departure of Karunanidhi and Jayalalithaa, leaving the BJP in the cold. The BJP’s brazen stoking of communal passions in Sabarimala may help it make a breakthrough in Kerala. If so, it would be critical, but may not mean much in terms of numbers. Both Andhra and Telangana are likely to witness regional battles with little space for the BJP or the NDA, since Chandrababu Naidu has broken off from the BJP. The results of recent by-elections in Karnataka suggest that popular disgust with the Kumaraswamy coalition government may be overcome by the combined strength of the forced marriage between the JD(S) and the Congress. We do not know yet if the BJP would strike a rewarding alliance in Tamil Nadu or Andhra Pradesh, but as of now, the BJP looks like it’s shedding 5-10 seats in this region. The North is not much of a separate region. It is just that the politics of Punjab and J&K does not fit into the pattern of the Hindi-speaking states. If one goes by the record of the local bodies elections and the implosion within the AAP, the Congress appears set to make small gains in Punjab. But that or a splintered verdict in the J&K hardly affects the national equation. It might add up to a loss of 3-4 seats for the BJP. Let us take a stock of all the 317 seats we have surveyed so far. In 2014, the BJP had won 91 seats out of these. This time the picture is unlikely to change very much. The BJP’s losses in the South, mainly in Karnataka, may be the net loss for the party in all these regions put together. All in all, we are looking at the BJP winning anything between 80-90 seats in the non-Hindi speaking states of the country. Let us say it is 91: No losses, no gains for the BJP. For the sake of simplicity, therefore, we can forget the rest of India in the electoral arithmetic of 2019. The final outcome depends entirely on how well the BJP can retain its tally in the Hindi heartland. Let us turn to that. The Hindi heartland is where the battle of 2019 will be won or lost. The BJP swept this region with 192 seats (203, if you add NDA’s allies in Bihar and UP). And that is the problem for the BJP. It can only go down from where it reached in 2014. All indications are that it will, almost everywhere in this region. Bihar may be an exception, as the BJP has recovered its alliance with the JD(U) to take on the resurgent and united opposition as well as to cut its losses. 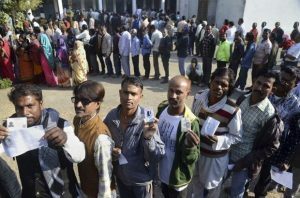 Polls suggest that the BJP state governments in Jharkhand, Haryana and Uttarakhand are very unpopular and would cost the party at least 10 seats in these three states. Nor is the party in a position to repeat its sweep in Delhi. 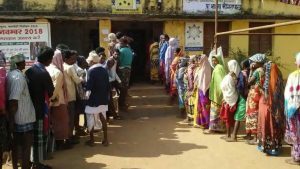 While there are different projections of the mood of the electorate in the upcoming assembly elections, everyone agrees that the BJP faces a rout in Rajasthan and a serious challenge in Madhya Pradesh and Chhattisgarh. Past records show that in these states, the assembly verdict is repeated in the Lok Sabha results. If so, the BJP could easily lose 30 seats in these poll-bound states. All in all, the BJP is looking at a loss of up to 50 seats in these Hindi-speaking states. could potentially reverse the 2014 verdict. The alliance can defeat the BJP in about 50 seats. To make matters worse for the ruling party, polls suggest that the Yogi Adityanath government is losing popular traction within two years of its historic victory. As things stand today, the BJP could lose up to 50 seats in UP alone and another 50 in the rest of the Hindi heartland. Is that how the big election would play out in the Hindi heartland? We cannot be sure. This is the one region that may not see only state-level contests. This is where the BJP would try and turn the elections into a presidential-style contest between Narendra Modi and Rahul Gandhi. Mr Modi’s popularity rating is way ahead of Rahul Gandhi’s. The level of satisfaction with the Central government is much higher than satisfaction with BJP’s state governments. This is also the region that is more susceptible to the Ram temple propaganda and hate mongering that the BJP has started resorting to. At the same time, this region has seen very little of the vikas promised by Mr Modi, has suffered most from loss of jobs and has been hit by farmers’ distress. The battle for the future of India will be fought as Jawan-Kisan versus Hindu-Mussalman in the battlefields of the Hindi heartland. As things stand today, the BJP is staring at a loss of 100 seats from the peak it attained in 2014. Unless something changes dramatically, there is no way the BJP can touch the 200 seat mark necessary for it to cobble up a majority. That would effectively put paid to Mr Modi’s prospects of a re-election. A lot can change between now and the election time. But that’s what it’s looking like. For now.